Description: The Brown tube worm is a highly significant and plentiful organism of the rocky shore filtering thousands of litres of water per day from a confined region. 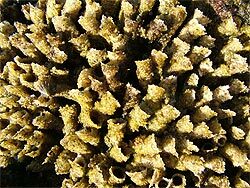 It can be identified by the colony of large diameter brown tubes that are constructed from sand and shell particles. Habitat: Colonies extend from low water spring down a metre or more into the sub littoral. They prefer regularly flushed regions such as the sides of surge channels and gorges. The dense colonies stabilise the environment by cementing boulders and rocks together. Ecology: It is a ciliary filter feeder and uses a crown of elaborate tentacles on the head to collect food consisting of plankton and organic matter. The brown tube worm breathes using the peristomial tentacles and through spoon shaped gills filled with red bl blood cells, located on the dorsal surface. 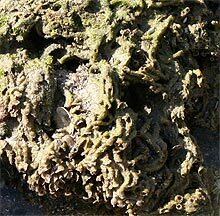 Unlike the white tube worm they do not have an operculum therefore are less resistant to dehydration. Despite this they are able to withstand dehydration to a certain extent through use of a pseudoperculum which is projections from their tentacles to close off their tube. The worms undergo synchronous spawning of eggs and sperm which fertilise externally. When the egg hatches it lives for around 2 months as zooplankton. The plankton then attaches to the substrate and build tubes. 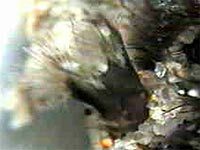 Due to variable larval settlement densities and short lifespan of approximately 2 years, colony sizes vary over time. The colony supports micro-communities which takes advantage of the living and feeding opportunities. This along with its capacity to stabilise the surrounding environment through the cementing and consolidation of boulders and rocks makes it an ecological synergistic organism.